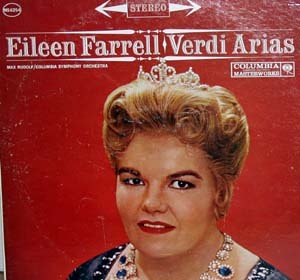 Eileen Farrel w/Max Rudolf and the Columbia Symphony Orchestra perform Verdi Arias from Aida, Un Ballo in Maschero, Otello, Simon Boccanegra, Il Travatore and La Forza del Destina. Black and grey Columbia Masterworks stereo LP MS 6254, jacket and vinyl both show signs of minor wear. Satisfaction guaranteed!